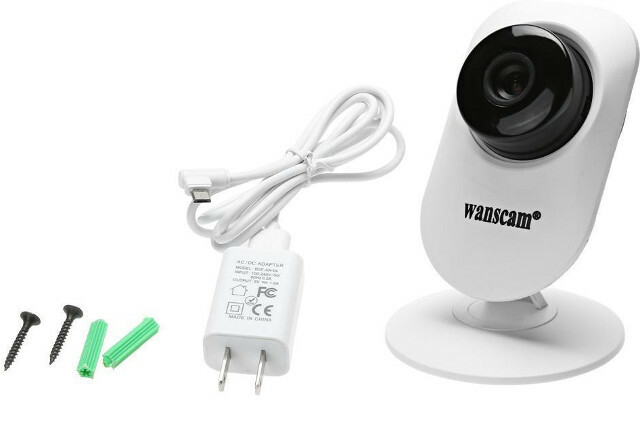 Wanscam HW0026 is a 720p IP camera with night vision, motion detection, and ONVIF 2.1 support that was launched in 2015, although they seem to have updated the model since then. GearBest now has a promotion for the US version of the camera for just $9.99 shipped. The version with the EU plug is sold for $15 shipped without any deep discount. Video – H.264 codec, AVI container, NTSC or PAL standard. The camera can be controlled from web browsers in desktop OS like Mac OS, Windows, or Linux, as well as Android or iOS smartphones using E-view 7 app. It ships with an English user manual, an accessories kit and a power adapter. I could not find custom open source firmware, or specific hacks for the camera, but since it’s compliant with ONVIF 2.1, it should be compatible with third party programs like Xenoma, and NAS with support for surveillance cameras. The old model was based on Hisilicon Hi3518E processor, but the new version appears to be based on Ingenic T10 MIPS processor. That USB Stick Looks Suspicious! Camera, Microphone and Battery Included. Does it have some management panel and free access to streams? I hope it doesn’t require any special (and usually stupid) app for viewing streams? It seems to run a linux no? *sarcasm* Let me guess, at this price point it’s one of those models that doesn’t get any software updates and which will be hacked next month and you can’t do anything but throw it away? to configure wifi, the cam required e-view 7 apps. the cam is running hidden AP initially and e-view 7 scans to do pairing via UDP protocol. the good thing, it has web access, and onvif 2.1.
needed to insall plugin on internet explore to view the stream. what a heck! it has jpeg snapshot to, I use it for home assistant. overall is same old quality streaming compared my old foscam 720P. this cam has identical user interface (my old foscam). this camera will goes to garage cam to replace aging 640×480 cam. $10 is good price. max price for willing to pay is $14. one good point as long as all features are off, the cam does not homing their server (based on my firewall). the default ntp goes to windows ntp server. 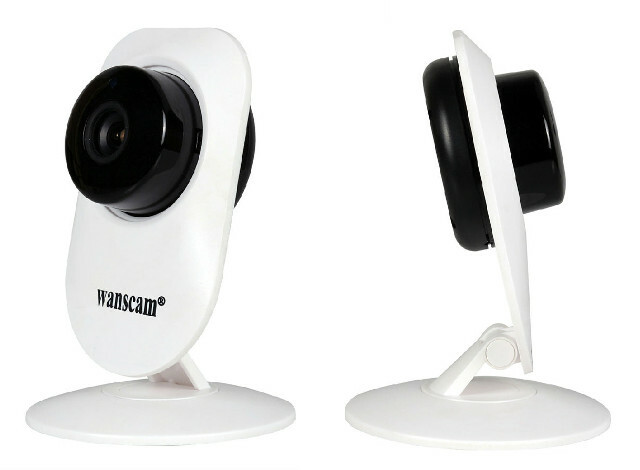 I do not know about the security flaws on this cam, running behind camera and never turn on swanscam features are always on my hands. I am running zoneminder which get feeding from cams. all cams are dummy(all features are off) and provide rtsp streaming only. Why does it, or even Wanscam, not appear on a search of Conformant Products in ONVIF.org ? Replying to myself, it finally worked. It seems the discovery mechanism is not very reliable and has to be run many times. I suspect the camera randomly attaches to various nearby access points. Use the E-View7 app to give it Wi-Fi access and change the camera password. Took a couple tries…but the speaker starts beeping when the config actually starts. Then you don’t need the app anymore. I can access with Blue Iris and Xeoma. Can also use VLC media player to watch the RTSP stream. Mine has an awful lens on it. It is not the correct lens for that image sensor. The four corners of the images are clipped off. Make sure your phone is set to use 2.4Ghz, not 5Ghz. The camera only has a 2.4Ghz radio. So on my phone, it will only work if I attach to a 2.4Ghz network first. Most of my ONVIF code works with it. There are some weird bits that I had to adjust my code to deal with. If they used the free to download testing tool at onvif.org, they’d find these problems. Looks like they have bought an ONVIF compliant stack but then their adaptation is not correct which breaks bits of ONVIF. I’ve bought a couple of HW0026 (hisilicon based) and both produce a quite audible cracking noise from the little speaker on the back. Probably it’s due to a poor shielding or bad assembly. Since I’m not using the speaker at all, I’m removing the wires to make them quiet. BTW, the 720p picture quality is quite good for this 10$ toy. Trying to achieve some hardening (perhaps assigning a static IP and removing the gateway?) since I’m configuring them for a local LAN use-case. I also disconnected the speaker. I think the wires are not hooked to the connectors very well. If I wiggle the wires around I can get it to stop. I have not tried, but you should be able to load an SSL certificate into them which will secure them. BTW regarding the speaker I could remove the files that are played at boot. The only thing is that none of the exploits I found worked so I had to open it and connect a serial port (it’s the 3-pin connector next to the micro-usb connector, inner to outer: GND, TxD, RxD). There’s a backdoor in it, an unknown root password, but you can interrupt u-boot and change the command line. So I booted in single user and modified the init script to change the password at boot (the rootfs is read-only), then telnet is accessible to root with *my* password and only this one. That’s much more convenient to hack with it. When I have time I’ll blog on how to get on it, but I’d rather find a solution which doesn’t require a screwdriver. At least to be able to disable the noise it makes at boot! Also there are 10 unused GPIO inside and one i2c eeprom so it’s likely that we can connect other I2C devices… if we manage to build the drivers for this outdated kernel 🙁 Otherwise software bit-banging should be OK to read temp and voltage sensors when used on batteries. The internal antenna is not very good but since it’s connected via an MXM connector it’s easy to replace it (which I did). I couldn’t find a way to manage the IR LED and filter via GPIOs, they seem to be claimed by the “encoder” application already. Mine has an awful lens on it. It is not the correct lens for that image sensor. The four corners of the images are clipped off. …. It does not appear in ONVIF’s list of Conformant Products. As you say most of your ONVIF code works with it, might one assume it’s ‘nearly compliant’ is good enough ? Other than the lens cropping the image corners, in your opinion does it make a good security camera (for the price) ? Mine boots and just does annoying “ding…. ding… ding … ding” all the time. e-view7 app does nothing (cannot connect or configure camera). Does it need open wifi network or something for e-view7 to be able to configure it? Make sure your phone is first connected to a 2.4Ghz access point. The camera only supports 2.4ghz. If phone is looking at 5ghz it won’t see it. Any one got mjpeg url for this camera? There is no mjpeg URL, however the camera can save captures to a micro-SD which you can remotely access from the web interface and by guessing the file name based on a web listing. The filesystem on it is bogus, so it doesn’t always display all file names and sometimes displays the same name multiple times. You sometimes have to try to download the same file multiple times before it works. Also there is a limit to the number of files after which they are not enumerated correctly anymore. I don’t remember how many, maybe around 150 or so. Oh by the way, mine is dead now. While I still have access to the OS, the web interface hosted in the “encoder” executable crashes because encoder cannot open /dev/video0 anymore. dmesg shows many errors trying to open the camera and failing. It looks like the camera or its interface died for no apparent reason. Mine used to boot and stop several times a day (5-10) depending on the power coming from a solar panel charging batteries. I don’t see why it would be related since it died after around 1.5 month. I definitely missed a working MJPEG URL, and the fact that the FTP upload doesn’t work. It would have been nice to be able to programmatically control the IR led. I’m not going to buy another one, too many constraints. I’ll probably end up finishing the one I was building from a nanopi-air instead.